Lance Armstrong has undergone successful surgery on the broken collarbone he suffered in a racing accident on Monday. The seven-time Tour de France winner was injured in a crash on stage one of the Tour of Castilla and Leon in Spain. The 37-year-old revealed on Tuesday that a scan had shown the broken bone had fragmented into “multiple pieces” and a metal plate would have to be inserted to strengthen the affected area. A message on the Astana rider’s twitter feed read: “All went well. Lance is in recovery. Same guy just 12 screws in his collarbone.” The surgeon who operated on Armstrong also declared the procedure a success, but warned that the American will require two to three months of healing. “Surgery was tough, but went well,” Dr. Douglas Elenz, an orthopedic surgeon in Austin, Texas, told CNN after the three-hour operation. “The multiple breaks made the surgery more challenging, but we’re confident that it is going to be successful,” added Elenz. Elenz said he used a four-to-five inch plate that he attached with 12 screws, each measuring one inch long, to stabilize the fractured bone. Asked to rank the difficulty of the operation, Elenz — using a scale of one to 10 — said, “If you wanted to pin me down it would be an eight.” Asked when Armstrong can return to racing, Elenz was non-committal. “We are just taking it day by day, week by week, month by month. Every fracture is unique. Each time I go to treat one, something is different.” Armstrong now faces a race against time to be fit for the Giro d’Italia, which starts on May 9, although he is expected to make a full recovery in time for the Tour de France in July. 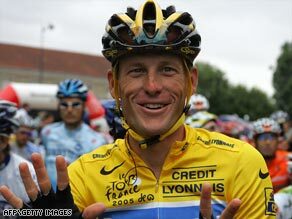 The injury is a major setback to Armstrong, who returned to racing this year after retiring following his seventh Tour de France victory in 2005. Armstrong, who recovered from cancer to become the most prolific rider in Tour de France history, decided to come out of retirement to promote his ‘Livestrong’ cancer awareness foundation.